Students currently in the social justice rotation of the 9th-grade Service Learning program have been exploring the topics of race and wealth inequality in America. 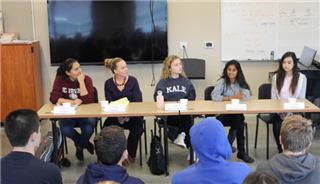 Last Wednesday, they heard from a panel of Upper School Service Learning students and community leaders who are attempting to address social change through their organizations. The goal of the panel was to show students how issues such as poverty can be addressed at a systemic level; and how charitable acts, including donating clothes or food, can be combined with policy work, political advocacy, and community organization to create meaningful, sustainable change. Many thanks go to panelists Andrea Gaspar from the American Civil Liberties Union; Sarina Lynn from Educational Enrichment Services; Alyssa Martindale '17, representing Hands of Peace; and Arthi Haripriyan '16 and Sarah Tatsumi '16, who discussed their work on homelessness.